Located West Estey Street Shullsburg WI Coordinates Lat N 42:34':200" Lon W 90:14':259"
Badger Park, like our Badger State, took its name from the area where some of the miners, like badgers, “dug-in” for the winter, while others called “suckers” moved south. It includes 81/2 acres of what was considered valuable land, due to the lead deposits found in 1838 and 1839, when 50 square feet of ground, with rights to mine, were bought for $250.00, It is east of Badger Hill where Jesse W Shull (founder of Shullsburg) built his home, about 1818. The west boundary of the park, now known as the Scales Mound Road, was once the Galena Wagon Road. 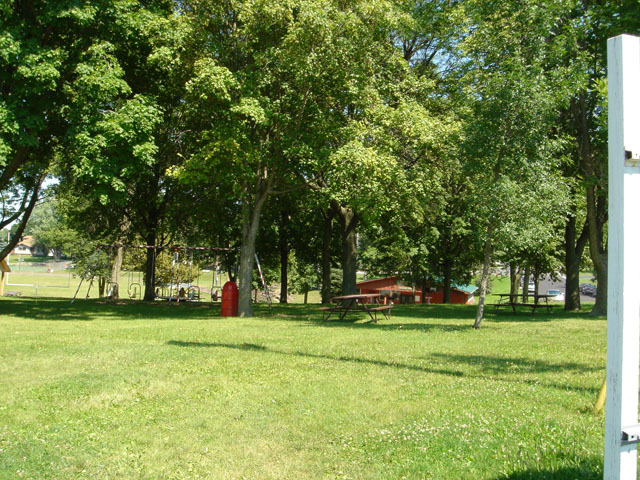 General Grant traveled it and watered his horse at the “Bull Pump” built by Beon Gratiot, who started mining on the very spot now occupied by Badger Park. The “Bull Pump” (probably the first water pump in this territory for controlling water in the mine shafts) was powered by a bull. This raised the water from the mine. 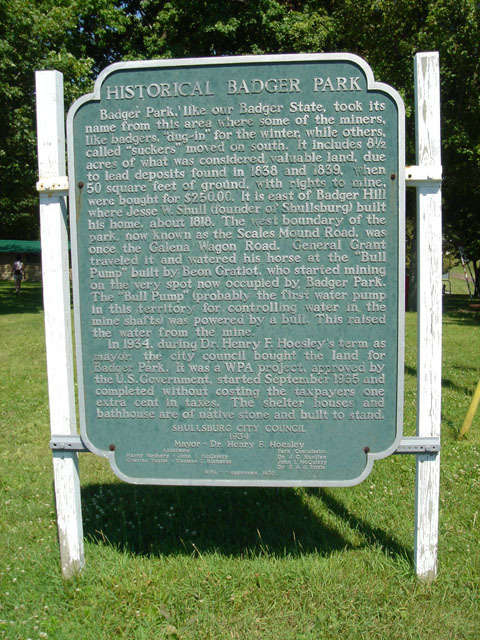 In 1934, during Dr. Henry F. Hosley’s term as mayor, the city council bought the land for Badger Park. It was a WPA project, approved by the U.S. Government, started September 1935 and completed without costing the taxpayers one extra cent in taxes. The shelter houses and bathhouse are of native stone and built to stand.